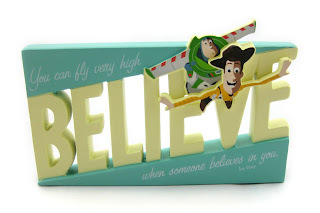 In the late fall of last year, Hallmark stores released a fantastic line of adorable decorative Disney·Pixar products. I couldn't help but purchase just about everything there and have reviewed most of them here on the blog; so if you're interested in checking others out, be sure to search "Hallmark" in the bar to the right. Just when I thought I was caught up, they have just released a "Phase 2" of products in stores now that I couldn't resist- including this fantastic Toy Story inspired word cutout piece featuring an inspiring quote (though not heard in the movie)- "Believe: You can fly very high when someone believes in you." This is a classy, really well made piece for any Toy Story fan's shelf or desk at home or at the office. It would also look great in a young kid's room or baby nursery. It measures approximately 5" W x 2.5" H x 1" D, is made of a resin type material and retails for $16.95. This hasn't been released online just yet, but I'm sure it will be up soon. In the mean time, if you're interested in picking this up, you can find it at your local Hallmark store. Anyway, thanks for dropping by! If you're a Pixar fan who loves to collect merch, this is the place for you. Be sure to come back daily to see more of my ever expanding Pixar collection.